I spent the weekend in Spokane and I have to say that I’m not sure if I ever need to plan a return trip. I knew we were in trouble when the hotel that we stayed at handed out earplugs along with the toiletries. We were literally on top of a train track and we heard trains passing by all night long. Not to mention that we were incredibly close to the downtown bus terminal. I don’t care what city you are talking about, the area directly surrounding a bus terminal is probably one you want to avoid. It is nice to get out of town and visit other places if only to make you appreciate home all that much more. We did have a nice dinner out and the drive was actually quite beautiful. It gave me lots of opportunity to dream up new recipes to try and I decided to start with this one. I do love to pickle fruit and it makes such a great addition to salads. 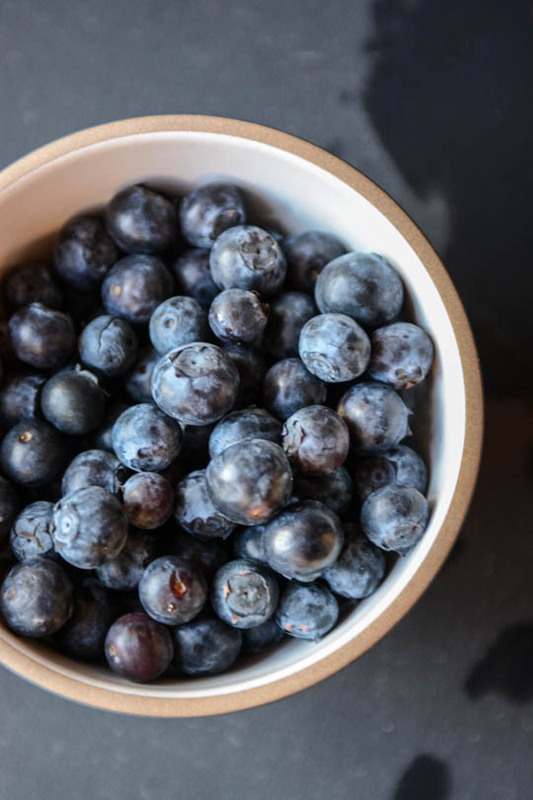 These pickled blueberries would also be delicious on bruschetta or for a wild variation try them on top of your favorite yogurt or ice cream. 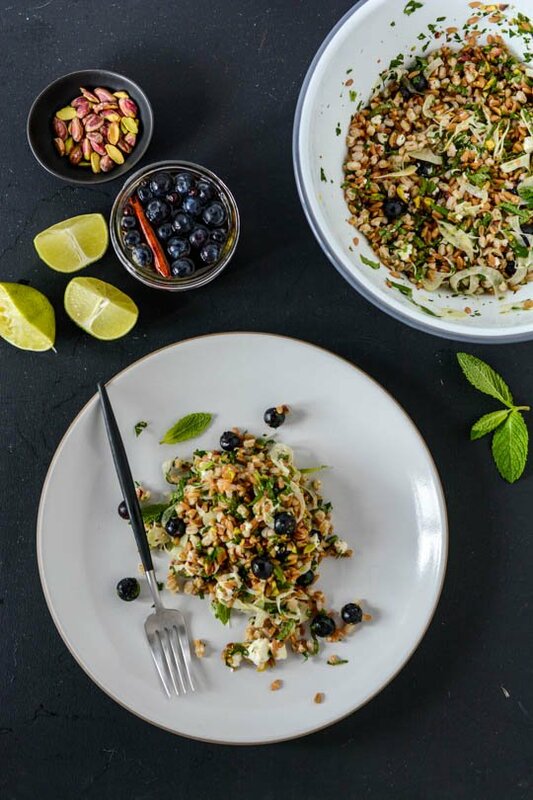 The farro gives a nice nutty chew that is really filling and don’t skimp on the herbs, they really bring everything all together. 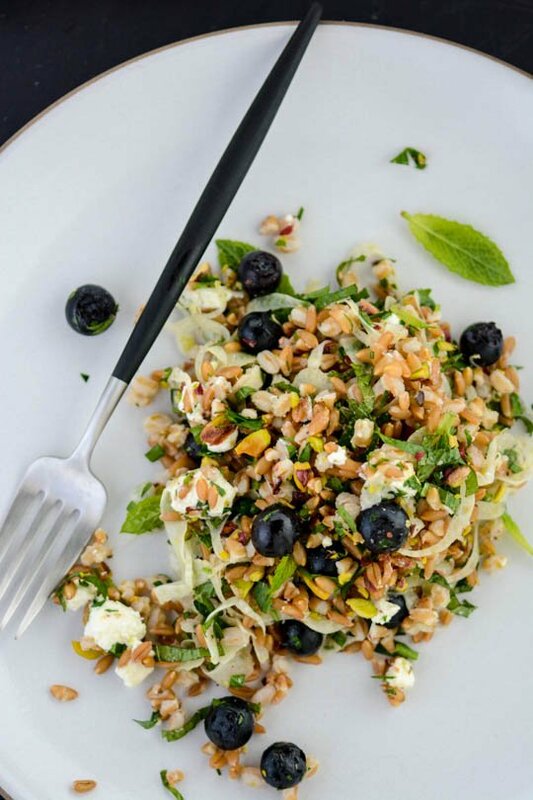 The salad will keep in the fridge for a few days, just hold back the herbs and pistachios until you are ready to serve. 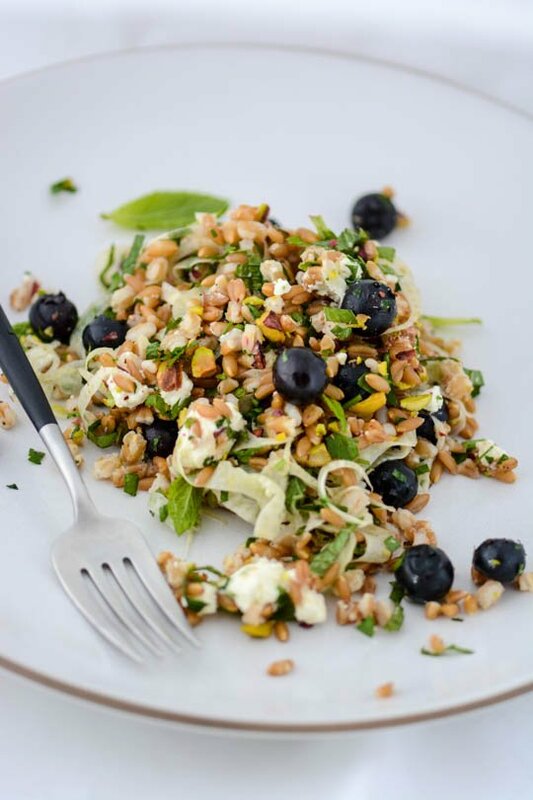 This salad is hearty and full of flavor thanks to the addition of pickled blueberries. 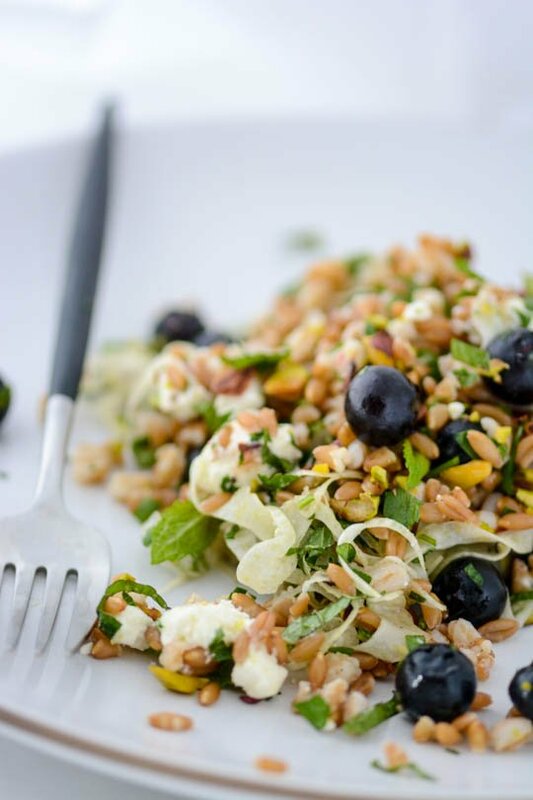 The salad keeps well in the fridge for a day or two so it's perfect for an office lunch or picnic. 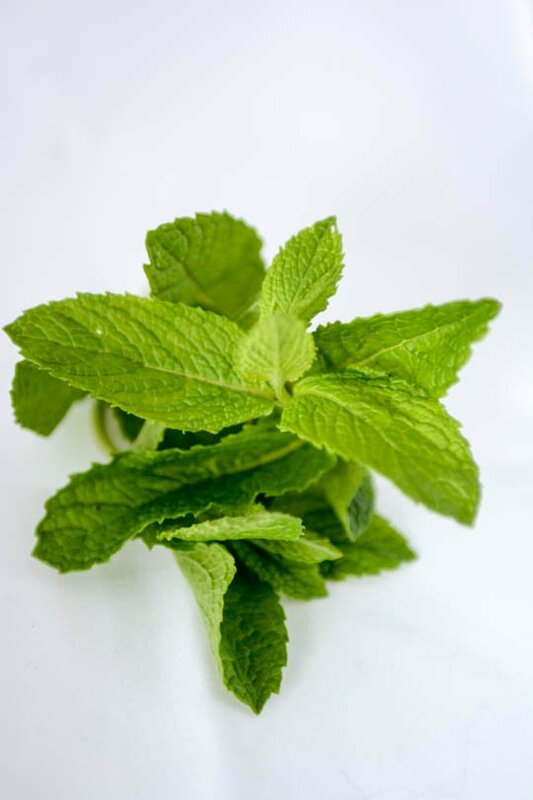 In a small saucepan place the vinegar, sugar, salt, cinnamon, juniper and bay leaf. Bring the mixture to a boil and stir until the sugar and salt have dissolved. 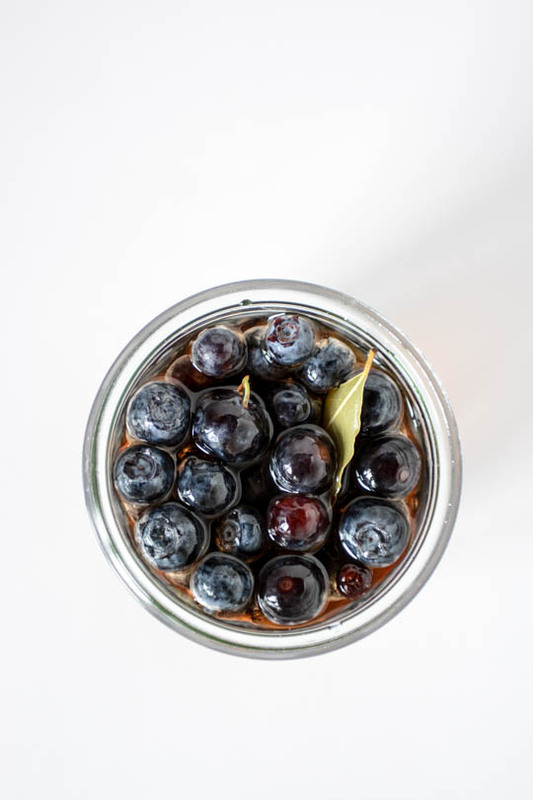 Let cool to room temperature and then add the blueberries to the brine. Refrigerate 8 hours or overnight. Blueberries will keep in the fridge for about a week. 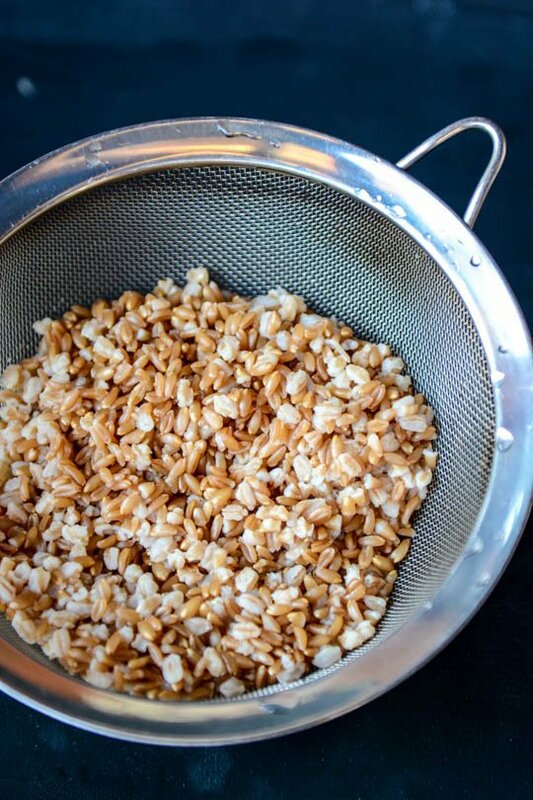 Place farro in a medium saucepan with 4 cups of water. Add a pinch of salt and bring to a boil: reduce heat and simmer until tender, 35-40 minutes. Drain and transfer to a bowl to cool. 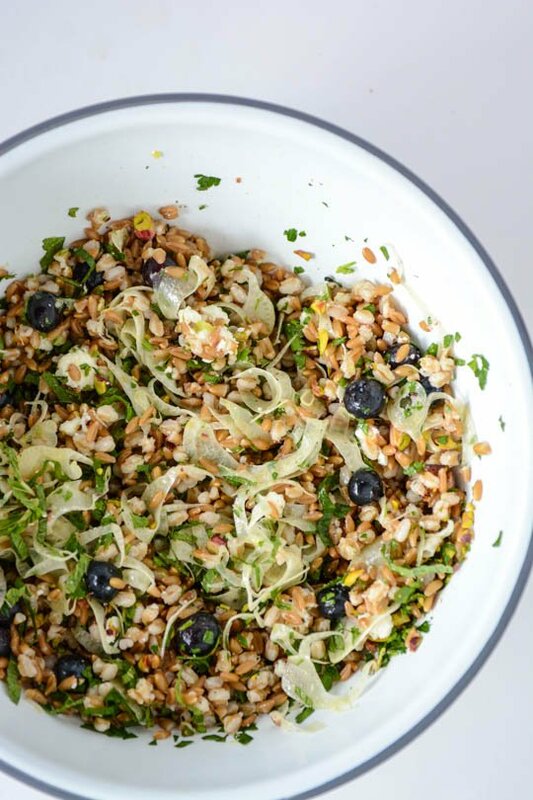 Add the farro to a large bowl along with the fennel, blueberries, parsley, mint, pistachios and feta cheese. Toss with the lime juice, olive oil and reserved pickling liquid and season with salt and pepper. Taste and add more of the brine as needed. Serve with additional pistachios and herbs on top if desired. When we stayed at the Ace in Seattle I thought it was cute that they had earplugs included in the room; until I realized you had to use them. Oh my god! I can’t believe that you had to put up with that at someplace like the Ace! Traveling can be fun but definitely have to be willing to roll with the punches!